GG Musings: Trying on My Sister’s Christmas Present! My sister’s Christmas present was supposed to be the striped Bravissimo dress in my dress haul from eBay. That dress ended up being too big for her (and ended up in my closet!). My sister decided after trying on and taking my Urkye wrap shirt that she wanted an Urkye dress for Christmas. I chose the color and the style for her – but if she reads this it won’t be a surprise! The Koperta dress is a vibrant royal blue wrap top dress. This dress is lovely and I kind of want one for myself! It comes in a ton of other colors: navy, black, tan and green. The only fit issue is that it’s a bit tight on the back. The jersey fabric is thick and the quality of Urkye clothing is amazing. Depending on the bra you wear this dress can be work appropriate or show cleavage. I’m wearing size 44 oo/ooo. My measurements in these pictures are 47.5-38-44.5 and I’m 5’7. How many of you buy clothing from Urkye? 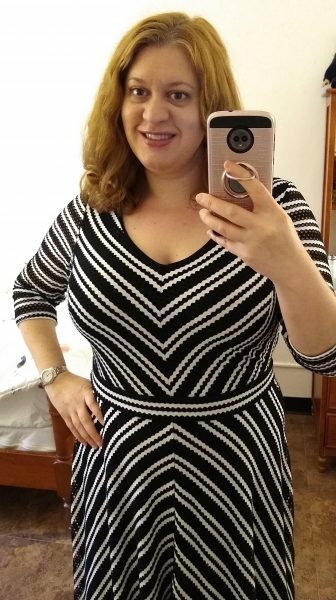 December 6, 2018 | Comments Off on GG Musings: Trying on My Sister’s Christmas Present!